I know you know them. They’re the ones whose homes you love and words you love more? Those bloggers you know would just get you and you would just get them. While we’re spending the day in NYC, I wanted to bring you a special treat today! My bud, Ashley, is SUPER duper creative and one cool mama. This post will definitely convince you of both. We’ve been busy little beavers over here. We began tackling the built in’s for the dining room redo, and those are 9 foot monsters, let me tell you. We’re thrilled with the way they’re turning out, and I can’t wait to share some pictures with you. 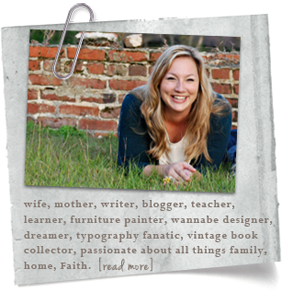 I am honored to grace the pages of Perfectly Imperfect today. I would like to extend a huge and humble thank you to Shaunna for this opportunity. Remember when I told you to come back to see how you could be featured on the blog? I’ve got some good stuff for you today, guys. I am so happy to have Miss Mustard Seed here today! She’s such a wonderful inspiration to us all, and better yet, she’s just an awesome person. We’re going to get some of her painting favorites, a topic well loved around here. Style Feature Favorites from Anne Marie at Twice Lovely! Guest Post at Finding Fabulous! :)Thanks to Jane! If you have time (and if you want to see a sneak peek of the playroom) you can go check it out here!